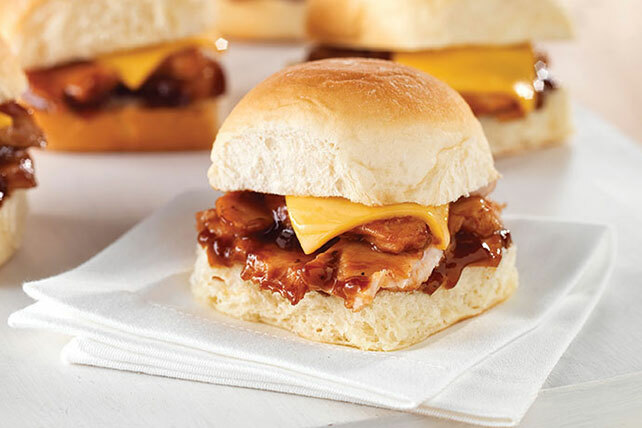 Beat out the sports bar flavor with these easy Hawaiian Roll Sliders. They’re so easy, you can make these Hawaiian Roll Sliders during half time. Cook chicken and barbecue sauce in nonstick skillet on medium heat 2 to 3 min. or until heated through, stirring frequently. Fill rolls with Singles pieces and chicken mixture. Substitute 3 hot dog buns, each cut into thirds, for the Hawaiian rolls. Makes 9 servings. Add pepperoncini peppers or banana pepper rings to the sandwich filling.